Starting with only a few meager powers and a weak demon ally bound to your relic, you must climb the tower, recruiting stronger demons and learning new skills in order to survive. The 23 floor tower awaits you, its layout generated anew each game. Over 150 different demons to recruit and summon as allies. More than 700 different abilities you and your demon allies can learn. Rich, detailed in-game descriptions drawn from real world mythology for each demon. The 11/26/2018 update contains bug fixes largely related to the new Demon Preservation mechanics introduced in the 11/9/2018 update. Wanted to get these cleared away now before beginning on the next major update. Demon runs on Windows 7 SP1+, Mac OS X 10.11+, and Ubuntu 12.04+. New build is up. :D Nothing too exciting, just a bug fix build, but I wanted to go ahead and release these fixes before starting on the next major update. Cheers! 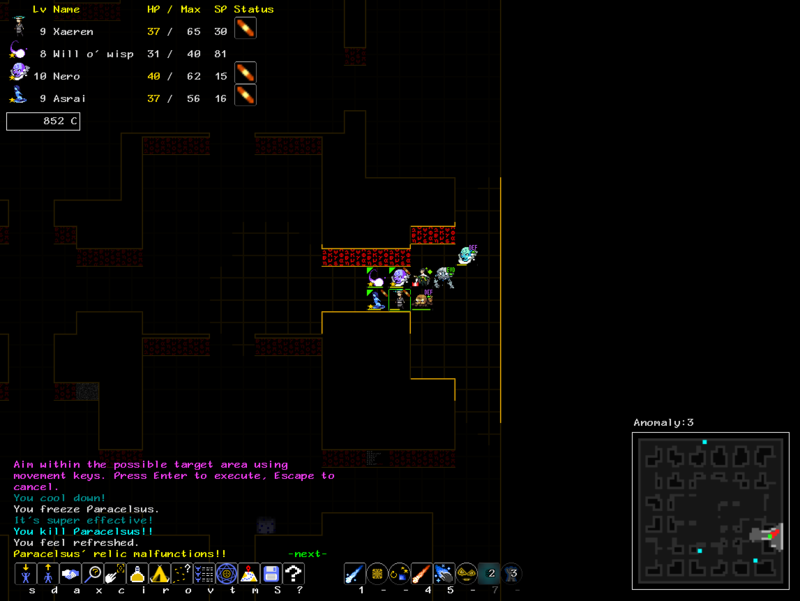 A great and unconventional roguelike that is challenging even to well-prepared players. In one of my first playthroughs I got to Anomaly:3 with a score of 4307, and ended up getting defeated by the summoner in there, which not only has proffessional strategy, fully upgraded monsters and powerful healing abilities, but also is at higher level at the player. 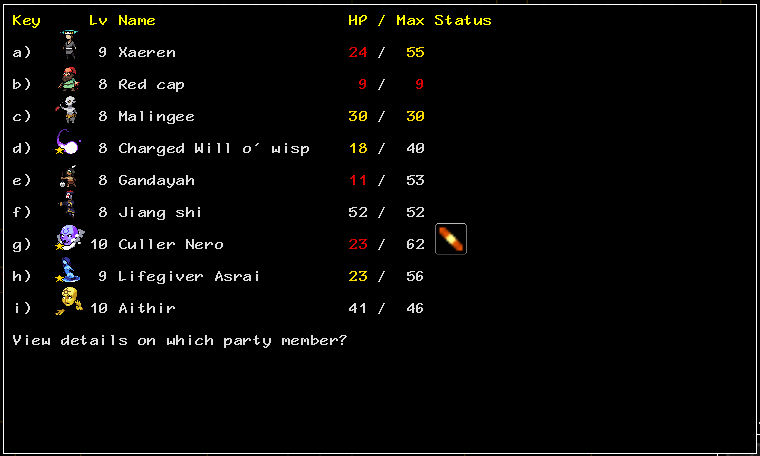 Anyway, my attempt to to get resistances from the will o' wisp at the cost of 9K was a bad move. :D Thank you, and I'm glad you're enjoying Demon. :) Paracelsus is a pretty tough fight, but it's impressive you got to him at all on one of your first playthroughs: the Anomaly itself is a nasty bit of work, long feared by even veteran players. :D Good luck on your future adventures in the Tower! In fact, I consider it not much harder than any other bonus location, if you plan your actions carefully. For comparison, being assaulted by a group of ogres in Arcadia or hordes of MaxHP draining enemies in Turdak's Sanctrum is a much more terrifying sight. Just for the sake of doing it, since it's easy to grab all stuff on the floor without putting up a serious fight with him. This time I've fully assembled my strategy just in time, and focused on draining his mana with my ice attacks. He did spawn with weaker minions this time, and I ended up only moderately wounded. :D Congrats! I don't know that I've seen someone use Ice SP-draining on him before, but I can definitely see how it'd help, and you usually can get all the pieces by the time you run into him. New build is released! Demon Preservation and revamped character creation are now available, and some of the previous restrictions on party composition and resistances have been removed. Enjoy! New build is up. :D The 9/30 build improves fullscreen support (particularly on Linux systems) and provides other bug fixes and quality of life improves. Enjoy! Whoops. Uploaded 9/1/2018_b to fix a small bug with a few modifiers having misplaced abilities. New builds posted! Enjoy experimenting with all the new abilities, and good luck in the Tower! No proper fullscreen yet, i see (still stretched), sadly. Hey folks. :) Just released a small update that adds multiple save slot support: you can now have eight different games in progress at once. Cheers! Why can I not download via itch.io app? it says not available on windows. Whoops! I forgot to check the little boxes to indicate which file is for which OS, apologies! Should be fixed now. I'm very grateful for your quick response! Thank you! No problem. :) Good luck in the Tower! The 5/13 builds fix a small bug that caused enemy summoners to sometimes spawn with only one demon summoned. Cheers! Whew! It's been a long haul, but the Matter build has finally been released! The new Matter element, fully fleshed out by the addition of over 80 new abilities and nearly 20 new demons awaits you in the Tower! Good luck! Are you still working on this? I played it quite some time, and I really like it ! Small bug fix build released that addresses a bug with AI healers sometimes failing to heal the player properly, a bug I did not want hanging around until the next full build to be sure. Enjoy! New build released! 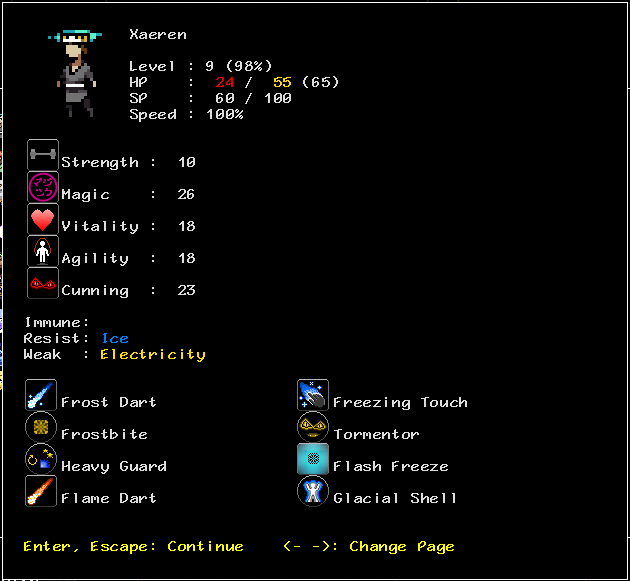 This one is mostly bug fixes and clean up, but it does also include the beginnings of expanding the commands available to demons, including the ability to only order demons with aggressive abilities to focus fire (rather than the old method, which also made your healing and buffing demons move in to attack.) Enjoy! Is it possible to play this at full screen, even with black borders to fill the space i don't mind, but i dislike having a floating window on my screen ? Any 2x zoom somewhere ? I only played less than one hour but it seem quite interesting, so far, and the GUI is well done. I'm on Linux if it matters. Hi, and thanks for trying Demon! I'm glad you're finding it interesting! 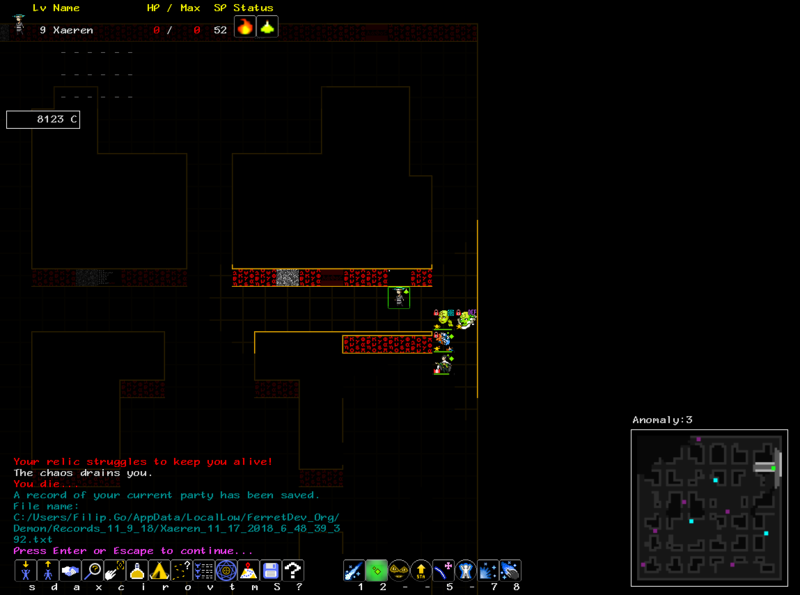 You should be able to enter full screen mode using F11 once you're in the main game (dungeon view.) Unfortunately, there is not a zoom mode at the moment however. Ah yes, F11 is going full in main game, not in menus. Issue is it's going fully fullscreen, so it's stretched because common screen size have different ratio than your game's window one (1920x1080 seems to be about 60% of the players choice in 2017, more or less depending on sources). Any way to add black borders to fit any ratio and keep the game pretty ? Hmm... I'll look into that and see what I can do. Thank you for letting me know there's an issue with it! Hi, any news on this ? Ah, sorry! I didn't catch this all the way down here: Itch doesn't seem to notify me about replies apparently. :( I only finally happened to glance down past the top of the list and see this one just now. I apologize again for what probably isn't a satisfying (and is definitely a late) answer. The best I can tell you is that I haven't forgotten about it (indeed, it has been reported a second time by another user a couple of week ago.) and will fix it when time permits. Ooof. Well, maybe THIS will be the last bug fix build for the 6/24 release. Fixed bugs with Poison+ and Poison++ and the Inner Fire ability. 6/25b fixes another, different, but equally vexing lock-up bug. Apologies for the rough release everyone! New build released, including a whole pile of UI improvements and bug fixes, most notably icon-based status effect displays to make it easier to keep track of what's going on in combat. Enjoy! Hey, small question, how are you generating seeds for each map/playthrough? if its name and ability based then attempts can be shared right? Will/Have you considered making starting relics/ablilities unlockable rather then everything available in the beginning? Re: Unlockable relics, I've thought about it a little! If I did do unlockables with the starter relics, I'd probably handle it like the Demonic Compendium: you'd have the option of just playing with everything, whether you had them unlocked or not, or you could run it with just what you'd unlocked. :) I'm usually in the "I want all the gameplay options now" camp myself, but I know there are definitely folks who like unlock-based systems too, because it makes things simpler for them while they're still learning by reducing the options that need to be considered, because it gives other goals to shoot for during gameplay, or both. Ok attempt is now public and sorted, youtube was being funny about the video. Are there more demons or just those in available at the start plus trait ones? Also redcaps are so hateful and never seem worth recuiting. Cool! :D I'll check it out when I get home tonight! 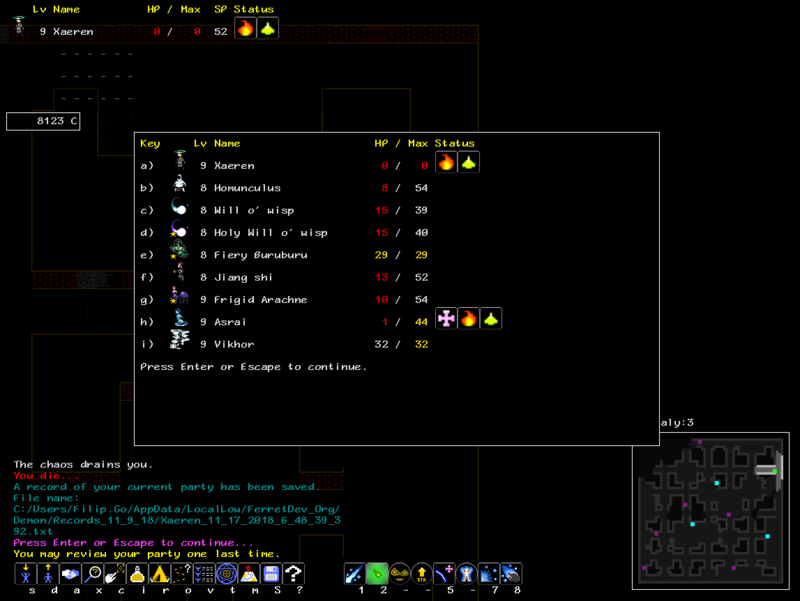 In the current version, there are over 110 different recruitable demons (this does not include variants due to random traits that can modify them.) Red Caps are a bit tough to convince to join you, but their free action self Accuracy buff and early ranged attack (even if it is only throwing rocks) are kinda handy. Annnndd as is becoming distressingly more common, uploaded a 1/7/2017 build which fixes a moderate-sized bug that prevented enemy demons from spending stat points gained from leveling. :P Apologies for the error, and enjoy! 12/11/2016 build is live! Enjoy, and good luck! 9/18/2016 build for ARRP 2016 is released! Enjoy, and good luck in the Tower! Great to see Demon itch! Congrats, Ferret!